Lace up brace yourself for a fitness journey. Want to make 2019 the year where you can finally tick “Get fit” off your New Year’s resolution list? If you didn’t meet your fitness goals this past year, start the new year on a fresh slate! Most importantly, find a suitable workout that you truly enjoy and can commit to. To kickstart your journey, joining a gym could give you a more focused direction as you’ll get to learn the basics of different workouts. Plus, having a supportive community makes sweating it out a lot more fun! So, check out these gyms at the malls of Frasers Property that will help you stay fit and fab! Shake it off, shake it off! Picture for illustration purposes only. If you think that working out is a chore, AXELR8 Fitness is here to prove you wrong. Discover how to put the fun back into fitness with their super energetic #32 Beats dance workout. With an aerobic-style routine, you’ll get to dance those calories away to catchy soundtracks. Talk about (literally) shaking up your usual exercise regime! AXELR8 Fitness also offers other classes like Combat HIIT, Kpop Groove, UBound and many more. So, get your family and friends in on the fun with their shareable packages at $108 for 8 classes, or $228 for 18 classes. After all, the more the merrier! AXELR8 Fitness is located at Eastpoint Mall. Easily incorporate workout time into your daily routine. Picture for illustration purposes only. With Anytime Fitness, we’ve got one less excuse to skip workout days! Open 24 hours all year round, you can hit the gym any time you feel like it, plus enjoy access to a whopping 4000 outlets worldwide. So, if you work irregular hours or travel a lot, this could be the gym you’re looking for. Though this global gym has a massive reach, every outlet makes you feel right at home with its non-intimidating environment and family-like culture. If you’re up for something more unconventional, you may check out their Dance Fit and Boxercise classes at Valley Point. Members get to join classes for free! Anytime Fitness is located at Northpoint City and Valley Point. Jump into a unique fitness experience! For a fun, effective and dynamic workout, check out BBounce Studio. Their rebounding trampoline exercises are high-intensity yet low-impact, benefitting your joints and lymph flow. 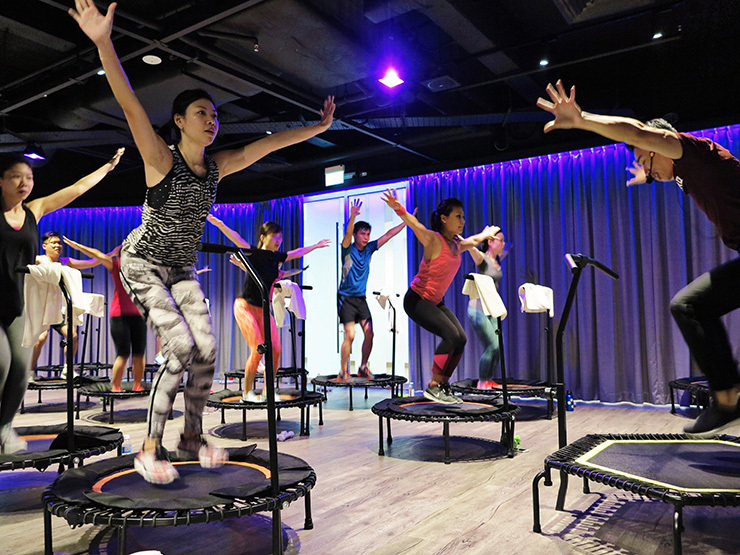 For those who wish to achieve a sculpted body quickly, sweat it out at the studio’s Signature Hybrid Rebounding Class. Or, take it easier and get your body moving to music hits at their BBOUNCE Lite Class. Just for our readers, enjoy special promotions such as a 1-for-1 Fitness Pass at $18 (U.P. $70), or a 1 Week Unlimited Fitness Pass at $35 (U.P. $245)! Simply quote “Frasers Experience Blog” when making your reservation. Packages: From $18 to $35 per class, or enjoy unlimited access from $170-$250 per month. BBounce Studio is located at The Centrepoint. 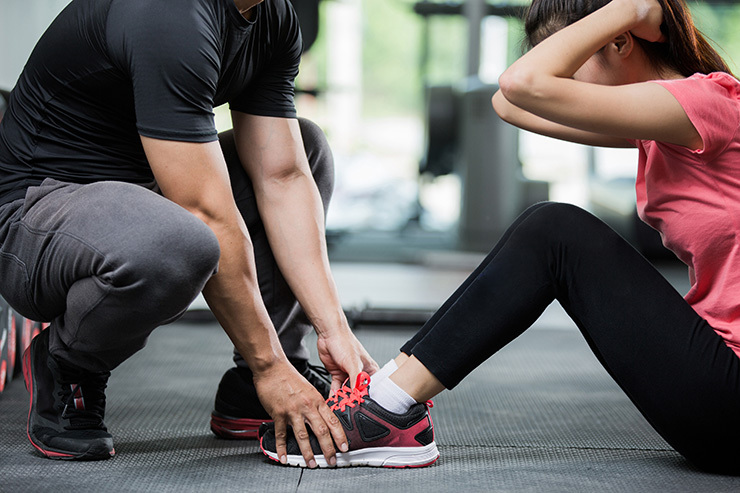 Personal training can help you meet your fitness goals more quickly. Picture for illustration purposes only. If you’re not sure about committing to a gym membership, Gymmboxx is a great place to start. Also open for 24 hours, this cosy, heartland gym is great for beginners who are trying to work out a fitness regime into their daily schedule. If you want to check out their facilities, simply drop by any time and pay a one-time entry fee of just $8. Plus, if you’re still not sure where to start, you can sign up for their personal training packages, where you’ll have a friendly trainer to guide and motivate you to get in shape. GYMBMBOXX Silver is located at Bedok Point. Build a healthy connection between your mind and body. Picture for illustration purposes only. Aside from helping you stay physically fit, yoga is a beautiful practice that strengthens your mental well-being. So, if you’re looking to cultivate a healthier well-being amidst hectic work life this year, try yoga. A great place to start your practice is Real Yoga, a comfortable studio that offers a series of personalised training to match your schedule. Their certified Yoga Instructors from India with over 10 years of experience are also committed to provide one-to-one guidance to correct your physical posture and mental welfare. With almost 30 classes with an interesting mix, you can be well-versed in yoga basics while getting to explore interesting variations. 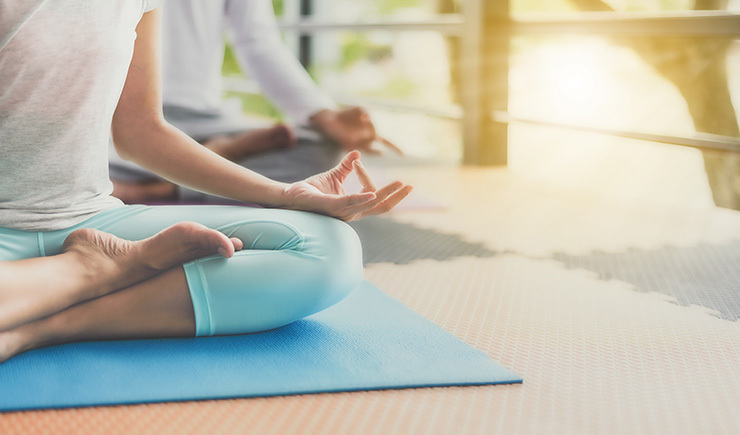 There are traditional classes such as Vinyasa, Hatha and Yin Yoga; more focused classes such as Body Opening (a specially designed class by their founder), Topsy Turvy and Back Bend; as well as restorative classes like Yoga Therapy and Gentle Yoga. From 15 Jan 2019 onwards, Real Yoga will also be introducing their all new High-Intensity Yoga Training class. It’ll be a heart-pumping, intensive fat-burning yoga workout suitable for all levels – sounds perfect if you’ve got to work off that holiday weight gain! *For first timers only. Terms and conditions apply. Visit Real Yoga at The Centrepoint for more info on rates and packages. With that, we wish you a healthy year ahead! Remember to enjoy your fitness journey and always be patient and kind to your body. Don’t lose heart when the going gets tough – press on and you’ll see the results before you know it!